Happy New Year everyone as I am on site for today's Big East matchup between the Providence Friars (11-3, 1-0) and the Marquette Golden Eagles (8-5, 0-1). #Providence is coming off a 65-63 win over Creighton on NYE, while #Marquette is coming off a 61-58 loss on the road to DePaul. 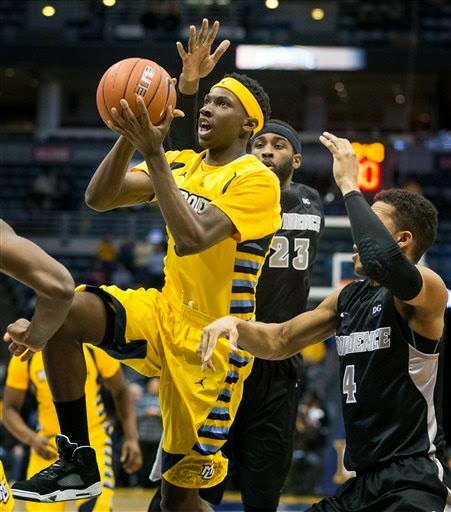 LaDontae Hinton leads Providence in scoring with 21.1 per game, while Luke Fischer leads Marquette with 13.6 in five contests. #Providence Starting Five: Ben Buntil, Kris Dunn, Jalen Lindsey, Ladontae Hinton and Carson Desrosiers. #Marquette Starting Five: Duane Wilson, Juan Anderson, Derrick Wilson, Matt Carlino and Luke Fischer. The Bradley Center is halfway full as tip-off approaches in less than ten minutes. First media timeout of the game as Providence leads Marquette 12-7 with 15:37 left in the first half. A good pace thus far as Marquette leads Providence 15-14 with 12:00 left in the first. Sandy Cohen giving Marquette a lift off the bench with back to back three's. Media Timeout #Marquette 31, #Providence 29 2:43 first half. Henton struggling to find his shot as he is taking some contested looks. Matt Carlino with his first points of the game to start the second half for Marquette. Ed Cooley calls timeout as Marquette's lead expands to 54-46 with 11:28 left. Fischer with two-handed slam as Marquette is up by 10— its largest lead of the day. Henton drains a huge triple from the baseline to pull the Friars to within nine points. Providence's inability to make free throws could cost them as Dunn missed both attempts and are still down six.